The sticky note for the fridge door has now had an upgrade. 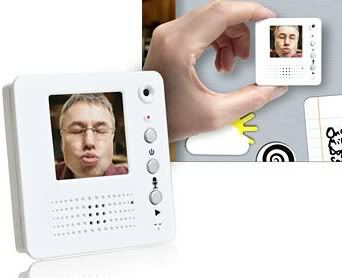 It’s now time for the digital video fridge magnet that allows you to store up to 30 seconds of video in it’s memory for leaving messages for others at home. The digital video fridge magnet has a 1.5 inch LED screen and charges via USB. * A fridge magnet with built-in video camera and 1.5 inch LED screen. * Record up to 30 seconds of video. * Push one button to record and another to playback – it’s that simple. * Only one message can be recorded at a time. * Built-in USB rechargeable battery. * Suitable for ages 12 years +. * Size: 6.5 x 6.5 x 2 cm.